BT has now unbundled 1.5 million lines for third party telcoms such as TalkTalk and Bulldog . The wholesale Openreach division was created last January to cope with the huge increase - 640 per cent - in this service as other companies battle to take customers from the retail side of the phone giant. Local Loop Unbundling (LLU) is when BT completely hands over the line to a third party telecoms provider - so you pay them the line rental instead of BT. Openreach unbundles the lines and manages the infrastructure of the telephone network - they're the people working on the green boxes at the side of the road. "Openreach is fully committed to ensuring that LLU continues to flourish in the UK, and the explosion in numbers is evidence of that," says Steve Robertson, chief executive of Openreach. "And we're going to spend around £1 billion this year on improving the access network still further." 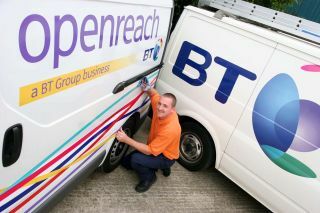 Openreach - the BT business that manages connections to homes and businesses across the UK - announced today that it will reach 1.5 million this week. LLU lines have increased by 640 per cent since the creation of Openreach in January 2006.